For our traditional time of mid-week worship during the season of Lent, we will continue to gather on Wednesday evenings at 7:00 p.m. between now and Easter to reflect on what God has accomplished for us through the passion and death of Jesus Christ. At the heart of our experience will be the opportunity to meditate on paintings created by Ted DeGrazia of Tucson, Arizona. The remaining paintings, and themes, will be as follows: “Jesus is Stripped” (April 3), and “Jesus Dies on the Cross” (April 10). Following the sermon, quiet time for reflection will be provided. Worshippers will be invited to do one or more of the following: (1) light a candle for a loved one; (2) meditate on one of the DeGrazia paintings displayed on the chancel steps; (3) spend time in prayer at the foot of the cross; (4) remain seated and mediate on the image from the front cover of the worship folder. Prior to worship, we will gather for Soup Supper in the Fellowship Hall at 6:00 p.m. You will find a sign-up sheet in the Narthex. We invite you to put your name on this list to bring a pot of your favorite soup to share. Join us this Wednesday! Palm Sunday is only two weeks away, and it will be especially inspiring (and fun) at Saint Peter this year. In addition to our regularly scheduled 8:30 a.m. and 10:45 a.m. communion services, the high school youth will be serving a traditional pancake breakfast with all the fixings in between services. A free-will offering will be collected benefiting all the youth going on the Mission Trip to Anapra, Mexico this summer. After the second service, kids of all ages are invited to the annual StPLC Easter Egg Hunt. Rain or shine. Bring a basket to collect your goodies and bring a non-perishable food item for Covenant Cupboard. Click here for the complete Holy Week schedule. The giving of Easter Lilies is a way to remember someone and beautify Saint Peter during the Easter season. Envelopes to purchase an Easter Lily are in the chair pockets in the Worship Center. You may designate it for the honor or memory of someone or to the glory of God. Just fill out the information on the outside of the envelope, include your $10 donation, and place it in the offering plate. Deadline for ordering is April 14th. Thank you to everyone who helped make the first Saint Peter Community Conversation a success. 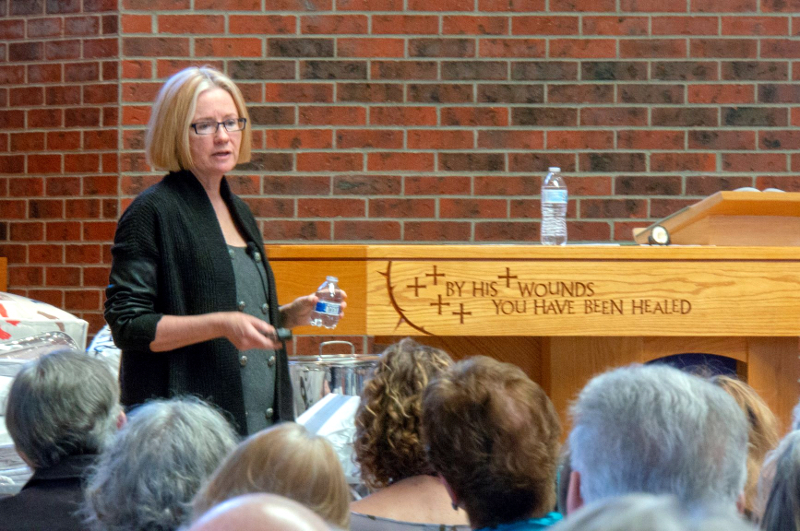 Click here for a short recap of the event and to learn about the upcoming Cultural Mentoring training through Lutheran Family Services. Faith Forum is continuing its series on Making Sense of the Cross, based on the book by David Lose. We have talked about the ancient theory of atonement around “Ransom and Victory” as well as the more recent theory of “Substitution, Satisfaction, and Sacrifice”. This Sunday, we will look at our third theory of atonement that emphasizes the cross as a powerful example of God’s great love for us, an example that both teaches and inspires us to love others. Please join on Sunday mornings from 9:40 a.m. until 10:30 a.m.
A BIG thanks to Karen Clair for organizing the Sunday School supply closet. What a job! Now’s a great time to donate blood for those who need it. The next Interfaith Blood Drive will be held down the road at Hope United Methodist Church (5101 S. Dayton) on Saturday, April 6th from 8:15 - 11:45 a.m.
To schedule an appointment contact Vitalant at 303-363-2300 or visit donors.bonfils.org and use site code E025. Donors are encouraged to complete their paperwork online on the day of their donation before coming to the blood drive. Visit vitalant.org and scroll to the bottom for the health history questionnaire. “Judith Mattison had a conventional 1940s Midwestern childhood, followed by college, marriage, and children. Still, throughout her life, she was haunted by a mysterious terror of deer head hunting trophies. With the help of a therapist, she began to recover memories of severe abuse at the hands of her father. Join the StPLC Property Team on Saturdays April 13th and 27th as they work to cleanup the outdoor grounds and plant flowers. The group will work from 8:00 a.m. to noon and are looking for people who can help. Bonus points if you can bring tools, especially chain saws, wheel barrels, rakes, shovels, pry bars and miscellaneous garden tools. If you plan to attend and/or provide tools (so we won’t need to rent them), please contact Dave Prichard. Yes, we love to send our high school grads off to their first or second year of college with a little extra financial help…but we also want to help people of any age who are considering other kinds of educational ventures: a course to make a new job possible, retraining, a certificate program….really, pretty much anything as long as it’s accredited, formalized and addressing a career-related, real-life goal. All applications and essays are due April 28th. If you are involved in the life of Saint Peter and already (or about to be) accepted into your academic program, we hope you’ll apply for this one-time $500 scholarship. Got questions? Check with Lori Williams or Ken Gerhart. A handful of Saint Peter's MOPS moms worked on a Habitat for Humanity re-build last weekend (pictured here). The home was located in the Westwood neighborhood off of Morrison Road in Denver. The crew helped to install new siding, which meant mastering the nail gun, miter saw and circular miter saw.